TERMIPol® DNA Polymerase is a thermostable DNA polymerase suited for MALDI-TOF mass spectrometry and other primer extension platforms. The enzyme has 5’→3’ polymerase activity and enhanced efficiency for incorporating unconventional nucleotides (ddNTPs and labeled ddNTPs). 01-03-00500 500 U 5 U/μl PDF PDF PDF 34.5 EUR Login to buy! 01-03-02000 2000 U 5 U/μl PDF PDF PDF 138 EUR Login to buy! 50% glycerol (v/v), 20 mM Tris-HCl pH 8.7 at 25ºC, 100 mM KCl, 0.1 mM EDTA and stabilizers. 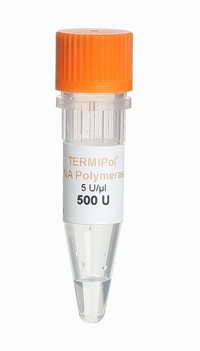 Shipping and temporary storage for up to 1 month at room temperature has no detrimental effects on the quality of TERMIPol® DNA Polymerase. The role of gene DCDC2 in German dyslexics. Wilcke A, Weissfuss J, Kirsten H, Wolfram G, Boltze J, Ahnert P.
A MALDI TOF MS-based minisequencing method for rapid detection of TEM-type extended-spectrum beta-lactamases in clinical strains of Enterobacteriaceae. Ikryannikova LN, Shitikov EA, Zhivankova DG, Il'ina EN, Edelstein MV, Govorun VM. J Microbiol Methods. 2008 Dec;75(3):385-91. Epub 2008 Jul 16. Relation between genetic markers of drug resistance and susceptibility profile of clinical Neisseria gonorrhoeae strains. Ilina EN, Vereshchagin VA, Borovskaya AD, Malakhova MV, Sidorenko SV, Al-Khafaji NC, Kubanova AA, Govorun VM. Antimicrob Agents Chemother. 2008 Jun;52(6):2175-82. Epub 2008 Mar 31. Role of genetic and nongenetic factors for fluorouracil treatment-related severe toxicity: a prospective clinical trial by the German 5-FU Toxicity Study Group. Schwab M, Zanger UM, Marx C, Schaeffeler E, Klein K, Dippon J, Kerb R, Blievernicht J, Fischer J, Hofmann U, Bokemeyer C, Eichelbaum M; German 5-FU Toxicity Study Group. J Clin Oncol. 2008 May 1;26(13):2131-8. Epub 2008 Feb 25. Investigation of promoter variations in dendritic cell-specific ICAM3-grabbing non-integrin (DC-SIGN) (CD209) and their relevance for human cytomegalovirus reactivation and disease after allogeneic stem-cell transplantation. Mezger M, Steffens M, Semmler C, Arlt EM, Zimmer M, Kristjanson GI, Wienker TF, Toliat MR, Kessler T, Einsele H, Loeffler J.
Clin Microbiol Infect. 2008 Mar;14(3):228-34. Epub 2007 Dec 8. Rapid microarray-based method for monitoring of all currently known single-nucleotide polymorphisms associated with parasite resistance to antimalaria drugs. Crameri A, Marfurt J, Mugittu K, Maire N, Regös A, Coppee JY, Sismeiro O, Burki R, Huber E, Laubscher D, Puijalon O, Genton B, Felger I, Beck HP. J Clin Microbiol. 2007 Nov;45(11):3685-91. Epub 2007 Sep 5. Optimization of quantitative MGMT promoter methylation analysis using pyrosequencing and combined bisulfite restriction analysis. The enhancement of homogenous mass extension reaction: comparison of two enzymes. Tikka-Kleemola P, Hämäläinen E, Tuomainen K, Suvela M, Artma A, Kahre O, Wessman M, Palotie A, Silander K.
Mol Cell Probes. 2007 Jun;21(3):216-21. Epub 2007 Jan 12. Molecular characteristics of rifampicin- and isoniazid-resistant Mycobacterium tuberculosis isolates from the Russian Federation. Afanas'ev MV, Ikryannikova LN, Il'ina EN, Sidorenko SV, Kuz'min AV, Larionova EE, Smirnova TG, Chernousova LN, Kamaev EY, Skorniakov SN, Kinsht VN, Cherednichenko AG, Govorun VM. J Antimicrob Chemother. 2007 Jun;59(6):1057-64. Epub 2007 Apr 18. MALDI-TOF mass spectrometry for multiplex genotyping of CYP2B6 single-nucleotide polymorphisms. Blievernicht JK, Schaeffeler E, Klein K, Eichelbaum M, Schwab M, Zanger UM. Clin Chem. 2007 Jan;53(1):24-33. Epub 2006 Nov 2. Three novel thiopurine S-methyltransferase allelic variants (TPMT*20, *21, *22) - association with decreased enzyme function. Schaeffeler E, Eichelbaum M, Reinisch W, Zanger UM, Schwab M.
Cytochrome P450 2B6 activity as measured by bupropion hydroxylation: effect of induction by rifampin and ethnicity. Loboz KK, Gross AS, Williams KM, Liauw WS, Day RO, Blievernicht JK, Zanger UM, McLachlan AJ. Clin Pharmacol Ther. 2006 Jul;80(1):75-84. Matrix-assisted laser desorption/ionization mass spectrometric analysis of DNA on microarrays. Kepper P, Reinhardt R, Dahl A, Lehrach H, Sauer S.
Clin Chem. 2006 Jul;52(7):1303-10. Epub 2006 May 25. Utilization of the three high-throughput SNP genotyping methods, the GOOD assay, Amplifluor and TaqMan, in diploid and polyploid plants. Giancola S, McKhann HI, Bérard A, Camilleri C, Durand S, Libeau P, Roux F, Reboud X, Gut IG, Brunel D.
Theor Appl Genet. 2006 Apr;112(6):1115-24. Epub 2006 Feb 2. Single-nucleotide polymorphisms: analysis by mass spectrometry. Sauer S, Reinhardt R, Lehrach H, Gut IG. Vereshchagin VA, Il'ina EN, Zubkov MM, Priputnevich TV, Kubanova AA, Govorun VM. Mol Biol (Mosk). 2005 Nov-Dec;39(6):923-32. Russian. DNA polymorphisms of the prion doppel gene region in four different German cattle breeds and cows tested positive for bovine spongiform encephalopathy. Balbus N, Humeny A, Kashkevich K, Henz I, Fischer C, Becker CM, Schiebel K.
Mamm Genome. 2005 Nov;16(11):884-92. Epub 2005 Nov 11. Momynaliev KT, Selezneva OV, Kozlova AA, Vereshchagin VA, Il'ina EN, Govorun VM. Matrix-assisted laser desorption ionization-time of flight (mass spectrometry) for hepatitis C virus genotyping. Ilina EN, Malakhova MV, Generozov EV, Nikolaev EN, Govorun VM. J Clin Microbiol. 2005 Jun;43(6):2810-5. SNPs and MALDI-TOF MS: tools for DNA typing in forensic paternity testing and anthropology. Petkovski E, Keyser-Tracqui C, Hienne R, Ludes B.
J Forensic Sci. 2005 May;50(3):535-41. Silhouette scores for assessment of SNP genotype clusters. Lovmar L, Ahlford A, Jonsson M, Syvänen AC. BMC Genomics. 2005 Mar 10;6(1):35.